My first annual survey, conducted with 100 global organizations in 2006, covered intranets, collaboration and what was then called “web 2.0” technologies. Top managers in most companies were out of touch with the reality of how people worked. Top management was focused on business, sales and the external world. This was only the first of many indicators over the last 9 years of research showing that management in many organizations is out of touch with how people really work. These figures varied no more than 2 or 3 percentage points over five years, from 2006 through 2010. 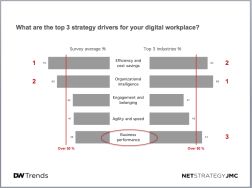 At this time I started asking people to identify their top three strategy drivers for the digital workplace. And things did not seem much better. But first, let’s take a look at three organizations where the digital workplace clearly serves business and customers. One of the 2006 survey questions was: “How do the senior managers in your organization perceive the role of the intranet?” Thirteen percent of the participants reported that top management considered the intranet to be “business critical”. 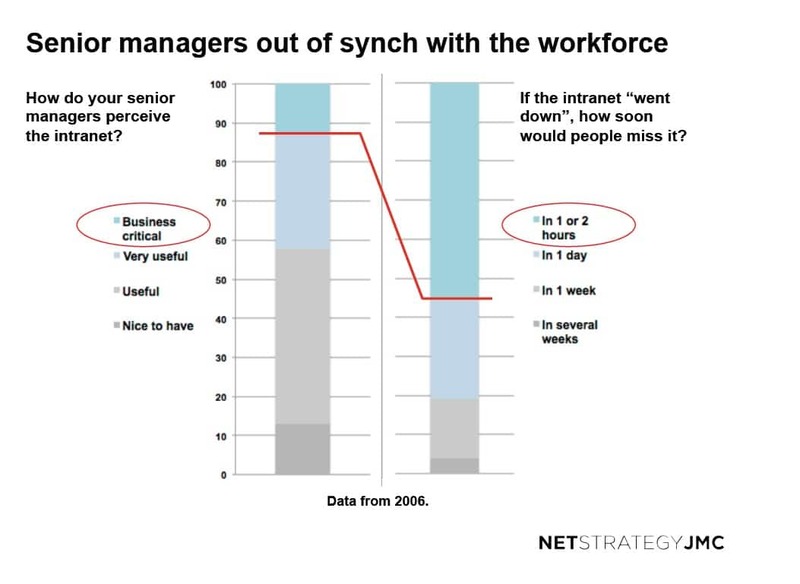 To the question “How soon would employees be disturbed in their work if the intranet ‘went down’?” 55 percent responded “in one to two hours”. 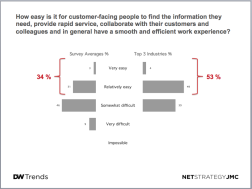 So the workforce in 55 percent of the companies used the intranet daily, if not hourly, in their work, yet senior management in only 13 percent considered it “business critical”?! Several years ago I worked with IKEA, the global chain of stores we all know. The first session of the workshop was dedicated to agreeing on the mission statement and its implications for their intranet. I kicked off the first exercise by asking them “What are the goals of your intranet?” The group of 12 intranet people instantly told me “Our first objective is business performance.” Unanimous. In 16 years of intranet and digital consulting, this is the first and only time I’ve had this reaction. Go to an IKEA store, and you’ll see all the sales peoples’ terminals displaying the intranet entry page. I checked it out in Avignon, France (near where I live) and saw the same entry page I’d seen in Sweden at the headquarters office. 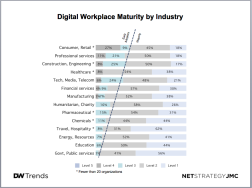 Business should be one of the strategy drivers for the digital workplace, but for many organizations it is not. 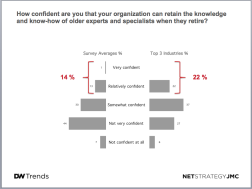 Now back to our figures about strategy drivers. Internal digital platforms and tools support the customer-facing workforce and the many people in an organization whose work leads to providing services and products for clients. 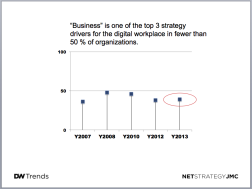 So why is “business performance” not one of the top strategy drivers? For years, way back at the beginning of intranets, communication was considered to be the primary goal of intranets. The renaissance of the term “digital workplace” reflects a slowly growing realization that yes, internal digital platforms and tools support business with external customers. Today, “business performance” is a strategic driver for 39 percent of the organizations. Looking back over the last 7 years, the figures hover at the same lowish level of around 40 percent. The industries where over half (55 percent or more) organizations included business in their top three strategic drivers are “construction/engineering”, “professional services”, and “consumer/retail”. These are also the top three industries on the maturity scale. Over 30 percent are at Levels 3 and 4. 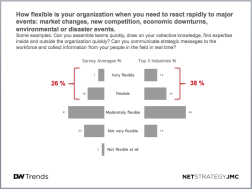 How flexible is your organization when you need to react rapidly to major events: market changes, new competition, economic downturns, environmental or disaster events?